As a young college graduate embarking on his dream job at Boston Consulting Group’s London office, Morten Hansen became obsessed with a colleague named Natalie. It’s not what you think: Hansen wasn’t infatuated with Natalie per se; instead, it was her work habits that drew his attention. Hansen, like many of his fellow BCG employees, was putting in grueling hours at the firm. Natalie, however, came and went at reasonable hours and yet was still able to accomplish just as much—if not more—than her coworkers. Hansen never did learn precisely how Natalie was able to get her work done at a high-powered firm in half the time that others did, but as he moved on from BCG to a successful career in academia, he remained captivated by the question: Why do some people perform so much better at work than others? Hansen, the co-author (with Jim Collins) of the bestselling book Great by Choice, is today a management professor at the University of California, Berkeley, and is considered one of the world’s foremost management thinkers. His new book, Great at Work, explores how top performers are able to achieve more at work than their colleagues. In writing the book, Hansen drew upon a comprehensive study of 5,000 managers and employees which revealed that top performers actually work less than many others yet are more productive and get better results. Through this and other research, he determined that top-performing employees share a number of smart work habits that allow them to focus their energies on a limited number of tasks. They’re able to filter out the distractions that plague the typical workplace and, as a result, be more productive while living a well-balanced life. 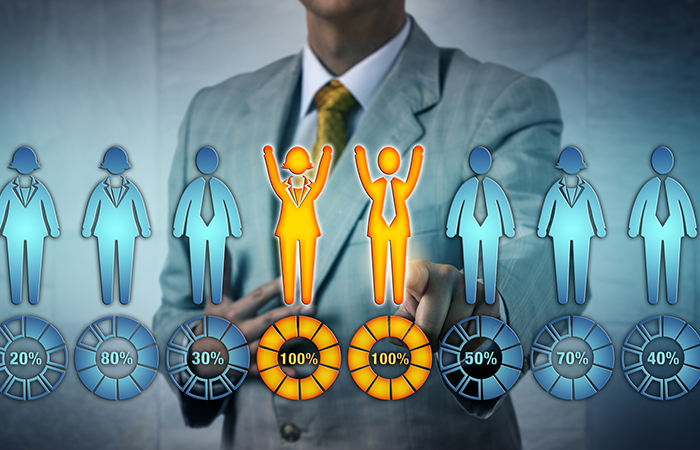 Hansen, who works closely with CEOs and CHROs as a consultant, says HR leaders have a vital role to play in helping their organizations become places where top performers thrive. In the following Q&A, he shares insights from his book—including why being a “yes” person is one of the best ways to be an underperformer in today’s economy. One of the seven “work-smart” practices you uncovered includes “shrewdly deploying influence tactics to gain the support of others.” Can you describe these influence tactics, and how one might acquire them? You have to be a forceful champion, which has two components: One is behaviors and tactics that inspire people, that get their emotions on your side, supporting your work, and you don’t have to be charismatic to do that, but inspiration alone is not enough. If you have people reluctant to support you, the naysayers opposing you, the question is how then do you persevere? And there’s a lot of writings about the importance of grit, which is basically perseverance. The problem with that is that in organizations, that’s not enough. If you’re not being tactical or shrewd or smart about your performance, you can just keep going like a bulldog and hit wall after wall. So it’s “smart grit”—you’ve got to persevere, but you’ve got to be smart about it, and that means deploying these influence tactics. You have to have cognitive empathy, the ability to put yourself in the shoes of others, including the people who might be reluctant to or flat-out opposed, to supporting you. If you can do that, then you can understand their concerns. A great tactic is bringing them into your camp. For example, a guy at Dow named Ian Telford was getting complete resistance from others in the company to his idea for a new online channel for selling chemicals directly to customers. Instead of saying, “You guys just don’t get it,” he puts himself in their place and tries to understand their concerns, and, taking these into account, makes changes to his proposal that end up bringing those former opponents into his camp. Arunachalam Muruganantham, an Indian villager, came up with a way to manufacture cheap sanitary napkins for Indian women who couldn’t afford to buy the existing brands, but he spent seven years unsuccessfully trying to sell them. Finally, he discovered that he’d barreled ahead on this without involving impoverished women, who’d been his sales target all along. So he came up with the idea of including them in his camp—”If I give you the machines for making these sanitary napkins, you can produce them, sell them to other women and become an entrepreneur.” And that’s how his business took off. What should HR leaders be doing to not only support and retain the top performers in their organizations, but get other employees to model their behaviors? First, I think the findings in this book have huge implications for HR. Think about recruiting—one of the principles is the ability to have great debates on teams. I asked an executive recently how he cultivates great performers, and he said that when he recruits people, he tries to ascertain whether this person would speak up in meetings or just be political and keep their mouth shut. In recruiting, you need to look beyond factors such as can the person code or their previous sales record, and determine whether they’re able to speak up in meetings, are they able to stay focused and set priorities, are they going to persevere and use smart grit? It’s behavioral interviewing—”Tell me about a difficult meeting you were in, was it hard to speak up, and what happened in that meeting.” So recruiting is a good starting point. But a second is helping managers. Work with them through training seminars, ensure they’re setting sharp priorities and are “do-less bosses” rather than “do more.” One problem with bosses is they give their subordinates too much to do, they’re not good at setting priorities, and that cascades down. They’ll say, “I know you’re working on three things, here’s a fourth.” There’s an assumption that the more I work I give you, the more you’ll accomplish and the better off we’ll both be. But it’s a false assumption, because there’s we have limited time and resources. A good manager arms them with “Here are three objectives we need to get done—go all in on these, and I will protect you.” That’s a great boss. HR has a huge role to play in cultivating that type of mindset, whether it’s through training, coaching, performance evaluations or a combo thereof. And speaking of training, that’s an area ripe for revolutionizing. So how does training need to be revolutionized? Training is done in a very old-fashioned way in most companies. We collect a group of people for a seminar, they show up for a couple of days and get loaded up with content, then return to work and forget the content. Nothing ever really happens or changes. Even online training is the same concept, only it’s online. None of it is truly integrated with work or is continuous. In the book, there’s a chapter on how people really develop and become stars in their field, and it’s a completely different model—it’s more aligned to how apprenticeships work: I do something, I practice it, I measure the outcome and get some real-time feedback, and then modify my behavior. But training is divorced from that model. And performance evaluations aren’t helping. Can you imagine Roger Federer’s coach observing him serving for one year and, at the end of that year, taking him aside and giving him advice only then? It’s absurd. No system of learning should work that way, and yet we still cling to the annual evaluation. Leading companies are questioning this model and even dismantling it. You need training plus immediate feedback while you’re working. How should this training be designed and delivered? We can accomplish this through technology, using these computers in our pockets called smartphones for an app-based training system. Don’t give me talking heads on video; instead, have a system that asks me what I want to work on professionally, and I go into a menu and click on a particular skill. For example, if I want to run better meetings, an app will give me not only information but practical steps and nudges that let me practice while doing. I’ve been looking for a system that can do that, but we’re not there yet. I can tell you that, as part of my research at Berkeley, I’ve developed an app for research purposes that can do this. We have a research study of about 600 managers at two large companies who are using this, and it’s led to big performance improvements for those managers. The feedback they’re getting from their teams has been very positive. The app lets them practice micro-behaviors that will result in more effective meetings and get immediate feedback, through the app, from the other people in the meeting on how well they did. Only 16 percent of the people in your dataset scored very high on the statement, “He/she is extremely good at focusing on key priorities, no matter how much work and how many things he/she has to do.” Why do you think so few people scored highly? We asked people why they have problems focusing and 21 percent cited distractions and temptations—smartphones are a big problem, that’s certainly something I see with my students. Twenty four percent said it’s because their boss can’t prioritize, and 38 percent said it’s their job duties—too many committees and meetings, collaboration expectations, too many tasks not related to their core job. So part of the reason is personal—you get distracted, the other part has to do with your direct boss, and the third has to do with the organization and the way things are run. The third part is the hardest to overcome. One thing people have to learn is how to get better at saying “No.” And most people are bad at saying no—they think they’ll be regarded as a bad performer. But the irony is, to be a great performer you have to be able to say no, because you have to be able to focus. Being a “yes person” in today’s workplace is one of the best ways to be an underperformer. It means you have to try and please everyone. You found that the seven “work-smart” habits didn’t just improve performance, they also improved people’s well-being at work. Can you elaborate on the connection here? I set out initially to find out why some people perform better than others, and this led to a secondary question: If that’s the way they work, then what’s the work/life implication? One, does your work interfere with your family and personal life? Two, do you experience burnout? And three, are you happy or satisfied with your job? And the bottom line is that the people who practice the Seven Principles scored far better on those three questions. The top performers I studied put in an average work week of 50 hours—that’s hard work, but not crazy-hard work. By working efficiently, they give themselves a time dividend that they can spend on their personal lives. That’s what top performers do: They work on a few things, put a tremendous amount of effort into those few things and take the time left over to balance their lives. By learning to say no to some requests, they’re able to perform better and have a good life outside of work. It’s interesting—the solution for work/life balance has often been presented in the form of a shield that protects employees’ personal lives from work, so you have some European companies that shut off access to work email after 6 p.m. But what about fixing work itself? That’s what the “do-less” approach does, which obviates the need for a protective shield. If you could put yourself in the shoes of an HR leader, how might you apply the lessons in your book to make your organization a better place? My hope for HR leaders is this: HR can become a real business partner by cultivating the right kind of top performers. And it can do that by helping managers simplify their work, get rid of stuff that’s not important, and set up better performance-evaluation systems, better recruiting and better training. Managers crave that—people these days are overwhelmed and spread too thin, and they’re stressed out as a result. We need to refocus the enterprise, and that’s where HR can add enormous value. One of the really cool things we do in the executive-education program I teach is called “the subtraction project,” and it’s run by HR. It boils down to: What are the things we can subtract from our work that aren’t needed, don’t add value, whether they’re meetings, processes or forms? I think that’s where HR can shine.